Whether it be from the influx of millennials into the workplace, the use of artificial intelligence, the rise of legal process outsourcers and alternative providers, or any of a host of fundamental changes, new market drivers have created a permanent change in the global legal market. Lawyers who steadfastly remain resistant to that change risk being left behind. 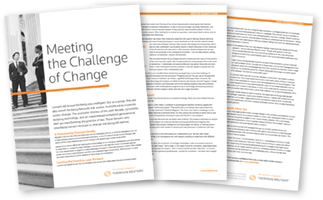 Fill out the form at right to download Meeting the Challenge of Change, a new white paper from Thomson Reuters.